Trellis – Artworks PHX – a business-arts campaign in Phoenix, Arizona USA. Front porch benches are the iconic symbol for neighborhoods that are friendly, inviting, connected and safe – the kind of neighborhood that everyone would love to call their own. Trellis, a nonprofit organization that makes stable homes and communities possible by educating, building and lending, had this in mind when it launched its “Good Neighbor Initiative” as a way to celebrate NeighborWorks Week, an annual NeighborWorks America program that mobilizes tens of thousands of volunteers, business people, neighbors, friends, and local national elected and civic leaders in a week of neighborhood change and awareness. 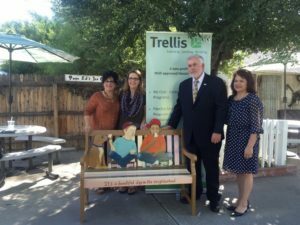 The Trellis “Good Neighbor” celebration is a recognition program that awards creatively designed front porch benches to individuals who are nominated as good neighbors within their respective communities. 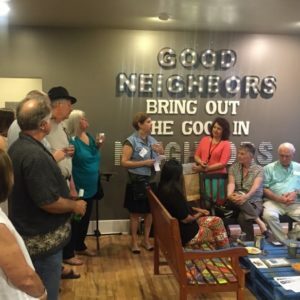 Local artists volunteer their talents to create these benches, partially because they love this initiative, and partially because they reap the benefits of publicity generated at the First Friday arts exhibition event that Trellis hosts to kick off the initiative. The monthly awarding of benches to these “surprised” Good Neighbor recipients – involving the bench artist, Trellis and local mayors or other city representatives – also provides an incredible experience for all involved.